Because when the day is a mark of something special, it has to be filled with sweet joys. And, what else can be sweeter than a delicious anniversary cake? So, now send marriage anniversary cakes online in India for your significant other via FlowerAura’s express delivery. Nothing quite compares the feelings of completing another 365 days with your soulmate. Right? It is indeed a beautiful feeling that cannot be summed up in words. This amount of joy can be only felt and celebrated on your anniversary day. And, to celebrate an anniversary, what you need is a delicious happy anniversary cake that can heighten the happiness of this special day. So, to make your anniversary celebration happier, FlowerAura offers you a mouthwatering range of marriage anniversary cakes that are best in quality. Also, our delectable range of anniversary cakes eg: "A Walk to Remember" "Especially yours Anniversary Cake" "Perfectly Matched Anniversary Cake" "Satiating Butterscotch Cake" "Exquisite Choco-Walnut Cake" "Butterscotch Delight Eggless Cake" etc. comes in a variety of flavors so you can choose the best as per your preference. From vanilla to chocolate, black forest to butterscotch, red velvet to pineapple, oreo to KitKat, blueberry to coffee, our cake shop have a wide variety of delightful cakes. Whether you are looking for a designer fondant wedding anniversary cake or a luscious anniversary cake with Photo or anniversary cake with name, we have all kind of scrumptious happy anniversary cakes that will take your special day to new heights. Along with our wide variety of luscious anniversary cakes, we also offer our online cake delivery via which you can send it to your partner or parents or friends or relatives. For example, if your husband stays miles away and he is unable to come home to celebrate the anniversary with you then, don’t be sad because you can now send a delicious anniversary cake online for him on the same day with express delivery from FlowerAura. To make the anniversary gift surprise even more special for your partner, you can also order happy anniversary flowers from us and enjoy our midnight delivery services. Is your wedding anniversary just around the corner and you are looking up for a delicious treat to make the celebration sweeter? If yes, you are in the right place. Our online cake bakery offers unique anniversary gift ideas that will surely make your anniversary a memorable one. And, guess what? If you order cakes and gifts from FlowerAura online, you can enjoy same day delivery. Now, you don’t have to go outside and get a cake delivered to your home by yourself. From FlowerAura, you can now order a delicious photo anniversary cake online from the comfort of your home. All you need to do is log in to our website, select a delicious cake you want to order for your anniversary, and place your order. Once your order gets confirmed with us, your ordered cake will be delivered to your doorstep just within a few hours on the same day of your order placement. Along with our same day delivery, we also offer midnight anniversary cake delivery to our customers. Yes, you’ve heard it right. 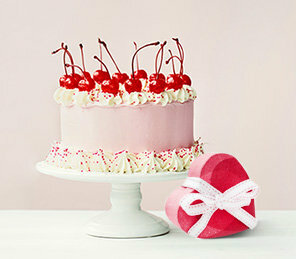 Now, you can make your loved one’s anniversary a way more special by sending a luscious cake online right at midnight. Just imagine, how special will your wife feel on receiving a scrumptious anniversary cake at 12 a.m. To express your love for your partner in a delightful way, you can also buy beautiful wedding anniversary greetings from us along with a rich and appetizing anniversary cake for your partner with no any extra cost.